"We have built great pharmaceutical empires bent on masking, subduing and eradicating pain, even emotional pain, from our lives. 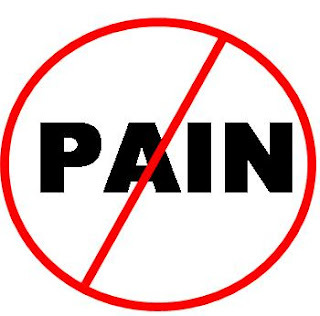 We are taught to view pain as an enemy, not a teacher. But pain is the right hand of growth and transformation. Pain is in the history of all human wisdom." I had a friend recently who had a most horrible thing happen in her life. Probably the worst thing that could ever happen. Her doctors gave her medications to stop the pain. She self medicated with alcohol. You couldn't blame her for wanting to feel a little less of what was happening. It made me think though about our desire to escape pain of any sort- emotional, physical, mental, whatever. I know I want to escape it sometimes. Obviously my opinions are influenced by my basic beliefs, but I don't know if we can always get away from pain. I am not sure we are even supposed to. Maybe sometimes we are just supposed to hurt....and then find ourselves still going. Maybe it helps us realize how strong we really are. Over and over I hear the sentiment expressed that "Women don't have to feel pain in childbirth. There are drugs available to stop that in this modern day and age. There is no shame in using them." For the record, I don't think there is any shame in using birth medications or pain relievers. But I do think it is false that you can actually totally avoid pain- in birth or in life. Oh you can try. People do that all the time. I just have my doubts about how effective they actually are at accomplishing it. We can skip the labor altogether and schedule a c-section, but there is still a recovery involved, and many women claim that the recovery is worse from a surgical birth than from a vaginal one. We can numb the body at the time of birth with an epidural, but then we lose the ability to actually deal with the pain physically and move and listen to it. We might end up with more severe physical damage like deep lacerations that could have been avoided with position changes or better baby positioning that is only possible when mom is mobile. We can take the edge off with intravenous medications, but they will influence our mental awareness of the situation and our emotional ability to handle the sensations. We can take pain killers after the birth to deal with the injuries and recovery of the birthing process, but they may pass through our milk, or make us unaware of when we are pushing ourselves too hard. I think that Ms DiFranco just might be right. We look at pain in the wrong way. We see it as an enemy to be conquered, defeated, and eliminated. We think that it has no purpose, nothing to teach us or warn us about. Maybe it is a teacher. A transformer. Something that brings wisdom and self knowledge if we are able to survive it. Maybe there is more to pain that what we see on the surface. I am young and relatively free of pain. I don't know if these ramblings really apply to life as a whole. I certainly wouldn't want to live in daily, excruciating, encompassing pain. That isn't something that I can really even fathom, and when I have felt it- my impulse is to just run away. I don't know about all of that. But I do think I know about labor. I don't think we are supposed to run from it, numb it, or try to make it disappear. We can try, but there will always be a consequence when we do. There are no free passes in birth. Each action has a consequence. Sometimes we may even find that the consequence of quashing labor pain ends up being increased pain when we are trying to care for our baby. Sometimes it means physical damage that doesn't ever heal. For some women it means numbness that doesn't go away. Labor pain IS different than some of the other pains in life. It DOES have a purpose. It IS a teacher. It is TRANSIENT. And when we are able to accept it and deal with it and let go it does make it easier and faster. The sensations of labor are meant to be IN labor. Not after. Thanks for another passionate post that, in my opinion, rings true. I agree that the pain of birth is something that we need to own and learn from, not run from, or try to cover up, however natural that fear and reaction may be. Having felt both a cesarean and a medication free home birth, and thus the recoveries for both, I agree that there is greater learning from actually FEELING the pain of the drug free birth and recovery. During my vbac homebirth, I was able to navigate my child's entrance into this world and feel when I needed to push or slow down to avoid unnecessary trauma. Oh yes, it was more intense than anything I'd ever felt in my entire life and I wanted to run like hell. But gritting my teeth and making it through without drugs was worth it. I feel that my connection to my naturally born child was much stronger at birth and for weeks afterward, having shared an irreplaceable experience with my baby and not having to recover from abdominal surgery myself. Natural birth did have pain in the recovery as well but it wasn't surgical recovery. In additional, after my natural birth I felt none of the guilt associated with my cesarean birth, the guilt of knowing that my sweet first baby was born pumped full of unnatural synthetic drugs, was unable to be held in my arms, and stare into my eyes and to nurse immediately. That is no way to welcome a child into this world, unless absolutely necessary. I also love your line, "There are no free passes in birth. Each action has a consequence." I'm sure you're not just talking about medications but I can't help but think of them again. They are always on my mind, the billion dollar industry of unnecessary drug pushing in birth. I think about how little we actually know about the drugs we are given to "ease the pain." Who knows the real, long term consequences of epidurals, Pitocin, Stadol, Demerol? We will find out soon enough, just as we are already finding out the consequences of other interventions and drugs on our bodies and our babies in decades past. I suspect there will be studies that finally unveil their dirty secrets and lawsuits larger than those against the cigarette companies for atrocities even greater. We must stay strong, face the pain of childbirth, embrace it, and teach our children that yes, birth does hurt, but it will teach you so much and you will be a stronger woman and more fierce mother because of it. Stay strong mamas! We can do it! But what about women who do not experience childbirth as painful? have had 2 children now, had homebirth which transferred to hospital on my first and homebirth with my second. Both were incredible experiences. Used GentleBirth hypnobirth method to help me deal with my fear of the labour (fear of the pain), but would not have said either of the labours (though both very different experiences) were painful at all. In fact my second was the most incredible and powerful experience of my life so far. First time commenter. I found your blog a few weeks ago. Love it! Have you ever read the book "Pain: The Gift Nobody Wants"? Actually, it may have been retitled under a new printing... Excellent, excellent book with the same theme as this post. The author spends a lot of time discussing leprosy (or Hansen's Disease) which kills the nerve endings and prevents sensations of pain. Which might seem like a positive, but because those with this disease cannot feel pain, their bodies and lives are destroyed. Pain really can be a gift. I agree with the commentor that mentioned what about the no pain birth. I believe pain is transformative yadda yadda yadda, but I also don't believe that pain is inevitable or necessary in childbirth. I strongly believe that we were not designed to experience childbirth as excruciating enough that we need pain meds. Working as a doula, I have seen many, many women have completely pain free childbirth (I've even seen ones that were truly a walk in the park, without much of any effort at all). I've seen some absolutely transformative and pleasureable - and these are ordinary women. It's our expectation of pain, so culturally ingrained, coupled with fear and tension, that leads to pain in childbirth. It is not inevitable or necessary, at least for the average women. But it requires a change in mindset. The mind is a very powerful tool. I've seen women declare how long their labors will last and when they'll happen, believe it completely, and it actually happened as they invisioned it. These are the women that find a way to face their labors not only without fear, but with delight and eager anticipation. We need to stop thinking that pain is inevitably connected with childbirth.